Yes I am crazy! 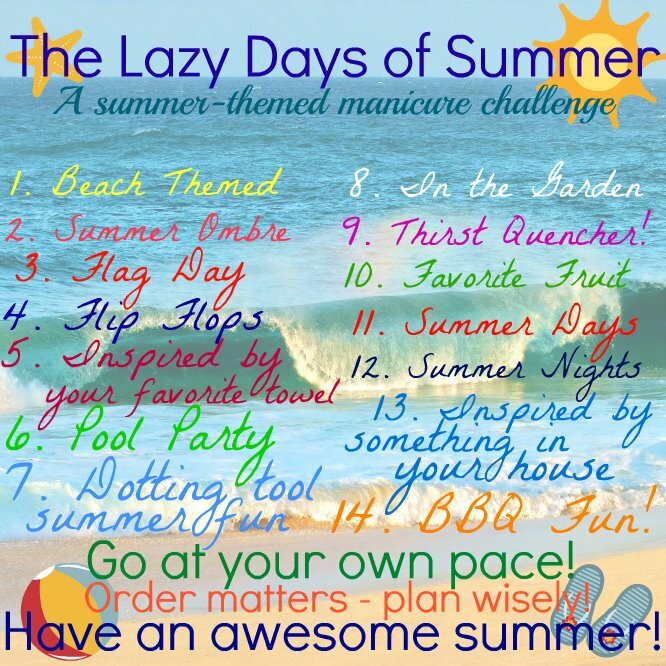 I was talked into doing another challenge for the summer. Okay, it didn't take much talking! I really loved completing the ASBMF Challenge because the ladies are totally awesome!! So of course I wanted to do another challenge with them! As you can see it's not as large as the Summer Challenge I am also doing, only 14 days. 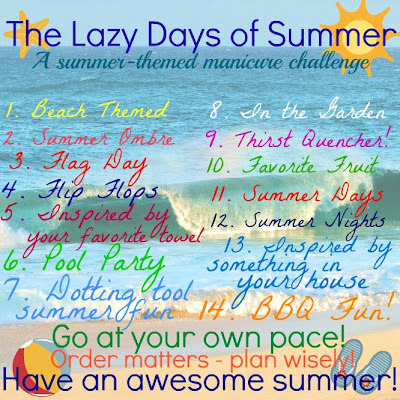 Right now I think I will do these challenges on the days I am not doing the Summer Challenge. This also means that I will probably be posting twice a day because I have fallen behind on my swatch posts. I have a bunch of polishes that need reviewed! On to today's challenge, beach themed. My inspiration for this challenge came from a blogger that I came across because she started following my blog. Elizabeth at Varnish Vixen has some amazing nail art on her page and she is also a butter LONDON lover like myself. She had done a post with a beautiful beach scence, here. Her design looked so amazing that I had to try it! It is also very easy to do! I started with 2 coats of Essence You Belong to Me. For my water background I applied Essence Let's Get Lost in the same way I would do clouds, just didn't make the "humps". Elizabeth actually taped off her nails for this step. For the waves I used a striping brush and various blue polish. First up was China Glaze Sea Spray. For my beach I applied China Glaze Classic Camel to my tips. I decided to not add all the extras, like a boat or grass, but I did add some clouds. I used Color Club Art Club White. When I look at this beach scene I feel like I am sitting on the beach looking out at the ocean and just enjoying the day! So cute, I love the end result! Nicely done! The sandy tips are an especially fun detail. This is so cool! I totally want to go to the beach! We did similar manis. I want to try mine again to look like yours though. SO darn cute! Love it! These look beautiful, great job! pssst, I'm Pryanka, not Pryanka <3 I loves your mani though, I wish I was this good with a brush!